Take 25% off summer-to-fall styles at J.Crew this week! Pick up now & later essentials like this crisp button-down (ideal for work! ), this cozy cashmere sweater (also love this one), or this classic trench coat. Two items that I could really use for transitioning into fall with ease would be these not-so-basic ballet flats and this pair of high-waist black skinnies. Did I mention there’s a ton of jewelry marked down too? Click here to explore all the items included in the sale, and be sure to enter code NOWANDLATER at checkout! Today and tomorrow only, enjoy an extra 25% off one sale item, 30% off two sale items or 35% off three sale items at Neiman Marcus! This pair of Rag & Bone boots are so comfortable and would look fabulous all year long. A ruffled Halston Heritage tank will look amazing under a structured blazer or leather jacket come fall! I’ll take this Phillip Lim cropped moto jacket, please and thank you. This Kate Spade crossbody is the perfect travel bag, don’t you think? And don’t forget about picking up the perfect pair earrings for fall – love the green + gold combo! Click here to start shopping the sale! Saks Fifth Avenue is offering up to 50% off tons of beautiful handbags this week! A few styles I have my eye on (and perhaps have in my shopping cart) include this Narcisco Rodriguez clutch (the silhouette is incredible), this bright red Rebecca Minkoff satchel, this laser-cut leather bag by Jason Wu, and this Milly snake-embossed leather tote. Click here to shop all sale bags! Great picks love number 1, 2 and 10. Obsessed with the MK dress and J. Crew sweater. I think I may add a few of the sweaters to my cart. I need a few sweater updates! I absolutely adore the Proenza Schouler! I love those PS1 bags! gorgeous palette. Love that chair, the sweatshirt…and those NB trainers. Love that Jcrew zippered sweater! Those Chloe heels are so pretty! Perfect bridge between feminine and vintage . I love these blue and grey inspirations! That chair is fab and that PS bag is stunning! Great picks! Love all of the blues and greys. That dress is gorgeous! I’m loving those earrings and the New Balance sneakers! The color scheme of this edit is great! Love love love that PS bag! Such a gorgeous color! 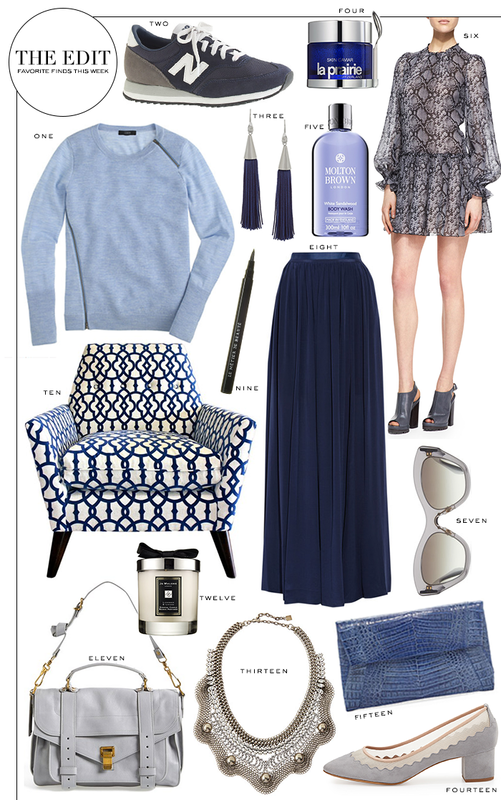 That blue crocodile clutch is everything! Loving all the grays and blues. Also crushing on the gorgeous Rebecca Minkoff bag as well!